Albert Unwin at the end of the War with his brothers. Albert, rear left,was then ex-No 4 Commando having been wounded in Normandy and having both ear drums perforated, he never recovered his hearing. Freddie, rear right, and Jimmy, front left, met my Dad by sheer chance in Normandy as they moved through the Commando during an advance. Freddie was driving a flame thrower Bren Carrier and Jimmy was part of the advancing infantry. Those five minutes was their first meeting for two years and the only one until after the war when this photo was taken. Jimmy was one of the troops who liberated Bergen-Belsen concentration camp, something he steadfastly refused to discuss, other than to say he never had enough bullets. 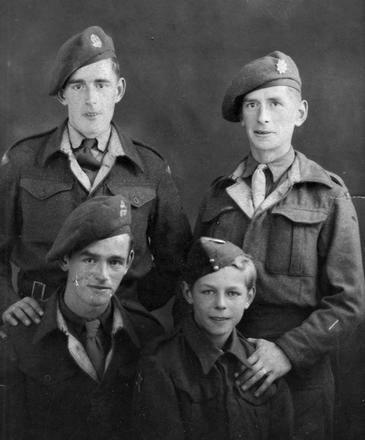 The fourth brother, Kenny, front right, was a cadet and too young for the Home Guard. The three older brothers all have wound stripes having been wounded in action, Jimmy twice.